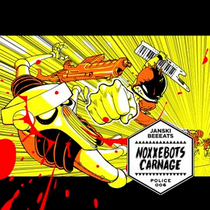 ‘Noxxebots Carnage’ is the latest release from electro artist and designer, Janski Beeeats. The Paris based manga and ‘80s video game fan (Jansé to his mum) has been quietly amassing a serious following for his 8-Bit releases, bringing him to the attention of French alt house label, Police Records. 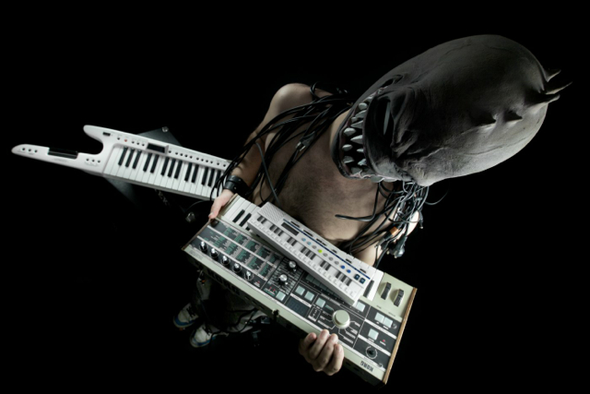 The music is a mixture of old school chip tunes, synthesized melodies and frenetic beats. Jansé has been perfecting his sound for years – learning his craft on an 8-Bit Amiga computer - the masked producer has shared the stage with the fellow luminaries like Alex Gopher, Ebony Bones, DJ Missill and Naïve New Beaters. His debut release, ‘Game Planet’ via Un Je Ne Sais Quoi, placed him firmly on club land’s radar. ‘Noxxebots Carnage’ is set in an imagined future, where the world’s been infected with a virus known as Bio Mud, turning the population into raging, bloodthirsty monsters controlled by the evil corporation, LBM Noxxe. Jansé has created an interactive video game for this release, where you battle your way through various levels accompanied by a thumping electro driven soundtrack. Showcasing a myriad of talent roped in to give this EP added punch, it features the remix efforts of Ed Banger favourite Krazy Baldhead, rising Belgium star Meridian, French disco house trio, WAEK and cult electro rock outfit, The Name. To round things off, Glitch-hop duo, MC2 lend their skills to ‘Dumbstep’. It’s out October 29, download his mini mix below.